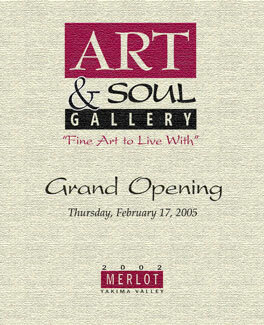 For our grand opening of The Art & Soul Gallery we wanted to do something special for our customers. The idea of a personalized wine label was perfect. The response was wonderful as people not only raved about the delicious wines, both red and white but were thrilled at the personalized label. Our clientele is pretty discerning so to be able to please them was quite an accomplishment for Northwest Cellars. We will definitely be back for another showing as we understand that the champagne is on the way!